With facilitation from NGO Sintesa and the Sintesa-supported village financial institution (Lembaga Ekonomi Desa, LED), 10 women experimented with an enterprise partnership group (KMUM: Kelompok Mitra Usaha Masyarakat). 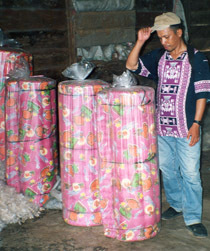 The production of mattresses is based on a division of labour among the group members. Some women work at cleaning and preparing the raw kapok. 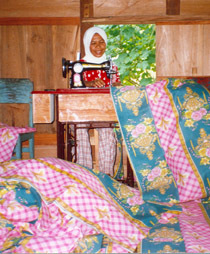 Two women work to cut and sew the mattress slip covers using peddle-powered sewing machines, while the another group frame sizes and sew the slips ready for stuffing with kapok and sealing off. Women are paid based on the contribution they make to the production process. The initial trial phase proved encouraging and in the early weeks of production the group fashioned 30 mattresses from an initial tonne of kapok fibre sourced from locally kapok fibre and shop-bought cloth. Initial sales in the local area were slow, as bulk marketing of mattresses relied on local inter-island traders, but the initial burst of activity was regarded as a learning experience to evaluate production requirements and develop a marketing strategy to enter the inter-island trade. The first mattresses were sold over a 6 month period and while the early enthusiasm and impetus to build the enterprise languished for a time, renewed leadership and support from the local LED gave the enterprise a new lease of life. A further 2 tonnes of kapok was acquired from a trader in the district capital (Raha), who also expressed interest in purchasing the finished products. The group also acquired the use of an old and disused village hall which was renovated and converted into a Kapok storage and preparation area. Sales have continued for the group who have focussed on producing singles, doubles and triple person mattresses to meet market demand. To sustain the success of the group, there are plans to improve the range of market outlets and perhaps diversify their activities into other prospective enterprise activities. One possibility for local marketing is palm fibre twine/ string which women fashion by hand into balls of twine known as buhu. The fibre string is used for fishing nets, string traps and a variety of multi-purpose uses. They sell for Rp1000 (12cents) a ball in local markets.